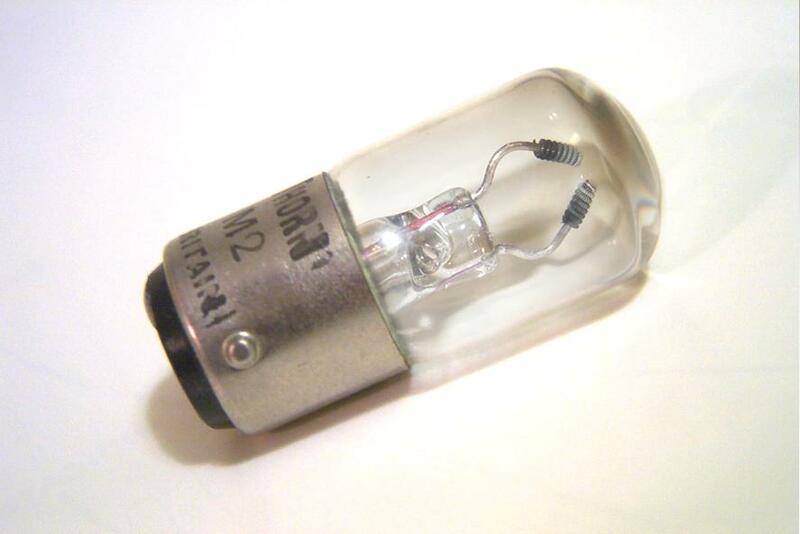 The M1 and M2 miniature mercury lamps were small sources intended for the production of long wave ultraviolet energy. They consist of a low pressure discharge in mercury vapour, and the visible and UV radiation they produce is especially useful in providing excitation of fluorescent materials at low illumination levels. The lamp shown here is the M2 version which is intended for operation on 200/250V AC supplies either with a choke or series resistance. In addition an M1 lamp was made which was designed to be operated from a 24V DC power supply with a suitable series resistance. The latter contains a tungsten filament running perpendicular and just below the electrodes, which aided in striking the discharge in the absence of a high open circuit voltage. These lamps were originally developed to meet the demand for a small source of both UV and visible light for such applications as exciting fluorescent pigments on aircraft instrument panels. Here, they replaced the very inefficient, hot burning and short lived miniature filament lamps having woods glass envelopes which transmitted only a tiny proportion of the deep violet and long wave ultraviolet light produced by an incandescent filament. Having been superseded again in those applications by miniature cold-cathode blacklight fluorescent lamps, the M2 lamp went on to be employed primarily in time markers for recording camera equipment. 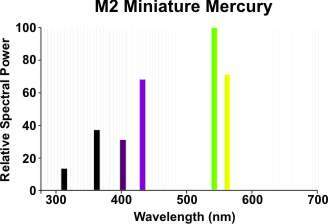 In addition it was used as a source of the 546nm mercury green line in laboratory instruments, and for various biological and entomological purposes including the light source in many insect traps.